The car you see here isn’t really a Prius. It’s a car we took a closer look at during SEMA 2017 (see video below), and it’s actually a custom chassis powered by a Dodge ‘Hellcrate’ 6.2-litre supercharged V8, with a Prius body dumped on top. But that doesn’t make it any less amusing to see this Prius-shaped monster hurtle down the quarter-mile, something it’s able to do in a little over nine seconds, with the aim of eventually clocking eight-second passes. 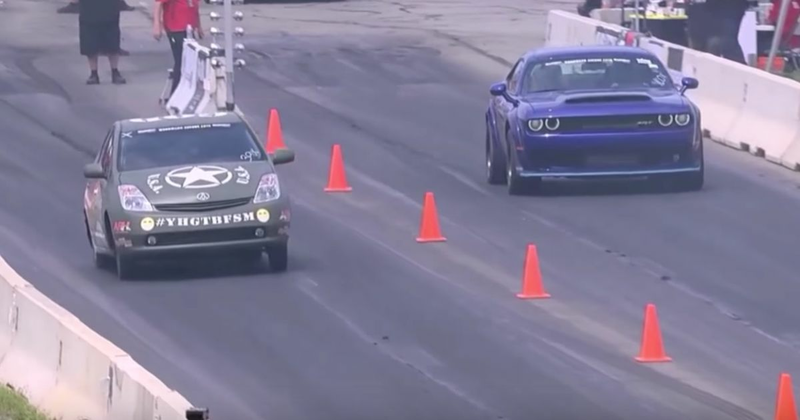 We’ve seen it in action before, but this is the first time we’ve seen it take on a Dodge Demon. No times are given for this run at the Dodge Roadkill Nights in Michigan, but we don’t need figures to sum up just how comprehensively beaten the Demon was - just look at the gap the ‘PriuSRT8’ is able to open up! We can’t say we’re hugely surprised by the result. Yes, the Demon may have 840bhp on tap, but thanks to the fitting of a 4.5-litre supercharger among many other modifications, the Prius makes 800hp. At the wheels. Plus, it’s also going to be quite a bit lighter than the drag-spec Challenger. Does this make us want a Demon any less? Nope.